What to make of the Tokyo gubernatorial election results? How can we organize a campaign to stop reactivating nuclear power plants that connects the whole country? How effective is the “single-issue” focus? On 9 February, amidst the biggest snowfall in 45 years Tokyo held its gubernatorial election. Only 46.14% of eligible voters turned out, the third lowest turnout on record. The winner was former Health and Welfare Minister Yoichi Masuzoe who won with 2, 112,979 votes, with the backing of the ruling Liberal Democratic (LDP) and the New Komeito parties. Kenji Utsunomiya, an attorney and former President of the Japan Federation of Bar Associations, came second. Utsunomiya came second the last time he ran for governor, in 2012, winning some 970 000 votes. The 2012 gubernatorial election was held on the same day as the general election due to the then Governor Shintaro Ishihara’s abrupt resignation. Despite the 16% drop in voter turnout – 140,000 fewer votes were cast than in the 2012 election – this time round Utsunomiya still managed to win 982,594 votes and exceed his 2012 efforts. Former Prime Minister Morihiro Hosokawa, backed by former Prime Minister Koizumi Junichiro, ran on a single-issue platform of eliminating nuclear power. He came a close third receiving 956,063 votes. Toshio Tamogami, retired General and former Chief of Staff of the Japan Air Self-Defense Force and head of the ultranationalist group Ganbare Nippon, was endorsed personally by former Governor Shintaro Ishihara, and received 610,865 votes. According to Asahi Shinbum’s exit polls, people in their 20s voted mainly for Masuzoe (36%) and then Tamogami (24%). Tamogami took 17% of the votes from those in their 30s, against Utsunomiya’s 15%. Even the conservative LDP look on Tamogami’s 600,000 votes with some caution. What can we make of these results? How should we understand the split in the antinuclear debate? And how should we fight against the Abe administration’s political attempts to change the Constitution and reactivate nuclear power plants? Utsunomiya and Hosokawa – both of whom ran on antinuclear platforms – won a combined total of almost 1, 940, 000 votes, as against pro-nuclear Masuzoe’s 2,100, 000 votes. If both antinuclear campaigners had united under a single banner there may have been a chance to beat Masuzoe. But is this the way that we should understand these results? According to opinion polls, a majority of people is opposed to nuclear power: is a single-issue focus on the nuclear question the most effective way to rally these people? Whose interests does Koizumi and Hosokawa’s antinuclear stance serve, and what kind of relationship should the left hold towards this grouping? We need to examine these issues in a concrete way during the debates and discussions that will undoubtedly occur. 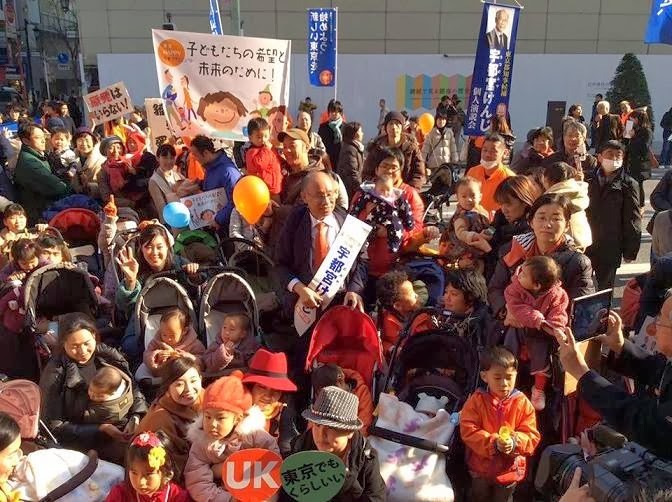 Yoichi Masuzoe focused his campaign to make Tokyo the world’s No. 1 metropolis for the 2020 Summer Olympics. He refashioned himself for the voters as someone who cared for his elderly mother, an expert on welfare from his days as Minister for Health, Labour and Welfare. When the Democratic Party came to power Masuzoe criticized his former party and stated, “The LDP has completed its historic role,” leaving the party and to form the New Renaissance Party. Given his expulsion, some in the LDP were wary of supporting Masuzoe’s candidacy. However, the previous Governor Naoki Inose’s abrupt resignation amidst allegations of a funds scandal involving receiving 50 million yen from hospital chain Tokshukai, laid to rest this hesitancy. Inose had won the election by a landslide just one year earlier with more than four million votes, endorsedby the LDP, New Komeito and Restoration parties. Inose’s dramatic fall from grace meant that attempts to recruit parliamentary candidates from the LDP, such as Hakubun Shimomura and Yuriko Koike (former Minister of Defense), to the gubernatorial elections were abortive. The LDP decided to endorse Masuzoe because they feared that if they lost the Tokyo gubernatorial elections this could hurt the seemingly invincible Abe administration. The LDP made a strategic decision to jump on Masuzoe’s bandwagon. Once the LDP decided to support Masuzoe, the LDP and New Komeito went into full-scale electioneering mode. They put all their strength into the Abenomics growth strategy of investment in development for the Tokyo Olympics. The Abe administration felt that they had to stop the victory of an antinuclear candidate at all costs. They were even willing to postpone a cabinet decision on the continued reliance on nuclear power as the basis of their Draft Energy Plan to focus on the gubernatorial election! The first candidate to put himself for election after Inose’s resignation was Kenji Utsunomiya. At the 2012 election, Utsunomiya was endorsed by the Communist Party, the Socialist Party, the New Socialist Party, the Green Party, and even by sections of the Tomorrow Party and Democratic Party. Utsunomiya could not, however, swim against the tide of reaction – the massive victory of Abe’s LDP and a return to the old regime, and the breakthrough of the far-right Japan Restoration Party. Utsunomiya could not manage to win even one quarter of Inose’s votes. This setback produced a negative response towards Utsunomiya’s campaign within the antinuclear movement. There was also criticism of the Communist Party, which had supported Utsunomiya from an early stage. Against this backdrop, there were moves in the antinuclear movement to forge a relationship with former PM Koizumi, who had been proactively pushing the antinuclear platform from the previous year. As an electoral strategy this made sense. Discussions to unify Utsunomiya’s campaign with Hosokawa and Koizumi’s campaign surfaced and intensified this year when it became apparent that former PM Hosokawa would enter the gubernatorial race with the support of Koizumi. It soon became obvious, however, that this unification amounted to unconditional support for Hosokawa’s candidacy at a stage when Hosokawa’s exact policy framework was unclear. In Kakehashi, newspaper of the Revolutionary Communist League, on 3 February I expressed my objections to Hosokawa and argued against unifying the campaigns of the antinuclear candidates. It was obvious that the meeting held by Citizens for a Governor against Nuclear Power (CGANP) was simply an attempt to drop Utsunomiya in favour of Hosokawa, even when his full policy platform remained unclear. The CGANP meeting favoured Hosokawa over Utsunomiya’s antinuclear platform because Utsunomiya, they argued, had given the antinuclear policy the same status as his other policies and thus, in effect, Utsunomiya’s antinuclear policy was lower in priority compared to Hosokawa’s. CGANP argued that running a single-issue antinuclear campaign was the best way to rally an extensive network of people and stop the Abe administration reactivating nuclear power plants. But the antinuclear campaign can only become a lived reality – and gain true power and social support – if it connects and combines with the range of compelling issues facing ordinary people: employment, poverty, human rights and peace. These issues need connected to the antinuclear campaign. On this basis I continued to support Utsunomiya’s candidacy. I do not think we can stop Abe’s strategy to promote nuclear power, Abenomics, constitutional change, the war state, neo-liberal deregulation, and fight against increasing poverty and inequality by focusing solely on an antinuclear platform. The results from the gubernatorial elections and exit polls show that people care about a variety of issues including welfare, employment, nuclear power and peace. People were not voting for a single issue but were basing their decisions on a wide range of policies. Starting from the first Fukushima Daiichi nuclear power plant accident, the campaign has linked this accident to problems in the political, societal and economic system that creates nuclear power in the first place. Through the campaign, people have become conscious of, and made links to, other issues surrounding the standard of living, work, and rights. As the campaign spreads, people’s consciousness to link other issues will expand and deepen. We should not stop this process but encourage it. This is a different argument from simply rejecting a conservative politician in the antinuclear movement. 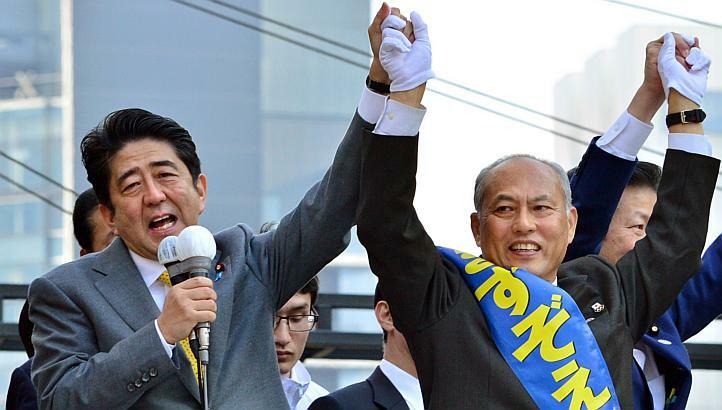 Masuzoe’s victory has given the Abe cabinet and LDP the “green light” to reactivate reactors. Prior to the victory, however, the ruling elite was concerned that the combined votes of Utsunomiya and Hosokawa would exceed Masuzoe’s votes. 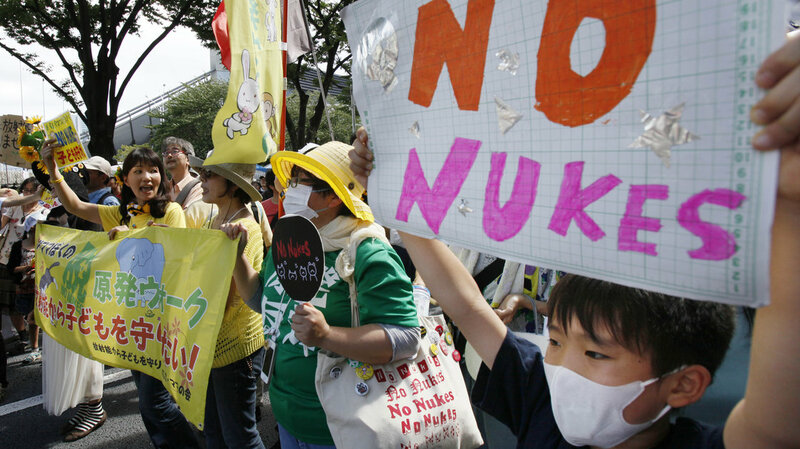 Now, they may attempt to reactivate nuclear power plants this summer. It is nearly three years since the accident at Fukushima Daiichi nuclear power plant. Far from things improving, the current situation at this power plant is dire. Leaks of highly contaminated material continue, and people’s health and wellbeing are threatened – there have been cases of thyroid tumors in children, not to mention the atrocious work conditions of those taking part in thedecontamination and clean up. Despite this, the government is promoting the situation as “safe and secure” and is encouraging residents’ hopes they will be able to return home. The government is forcing reactivation without having a clear idea of what caused the Fukushima disaster in the first place, or even conducting an actual investigation into it. On 8 March there will be meetings held to commemorate three years since the accident in three Fukushima locations: Fukushima city, Koriyama, and Iwaki. 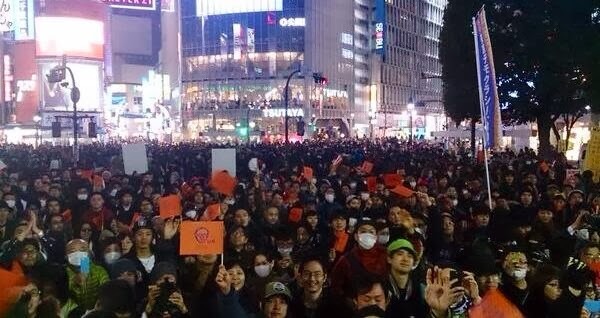 We need to mount a fight that connects the struggles of the people on the receiving end of the threats to reactivate the power plants in areas such as Sendai, Ikata, Genkai, and Ohi, as well as doing our utmost to rally campaigns across the country against nuclear power and reactivation, and for victim support. For this to happen, it is essential that we overcome the split that occurred in the antinuclear movement during the gubernatorial elections, and carefully continue to discuss and build on political strategies for our campaign. The issues surrounding the changing of the constitution for the right of collective self-defense; the construction of the new Henoko US military base; Abe’s plans to change the constitution to expand Self-Defense Forces; the deteriorating conditions for casual workers and the attacks on employment under Abenomics are all intimately intertwined with Abe’s Energy Plan for reactivation. We have our work cut out for us: a crucial part of the fight to stop reactivating nuclear power plants must be joint action to overthrow the Abe administration.